Are the red boards you refer to the same as the red boards on the Happ 3" trackball? 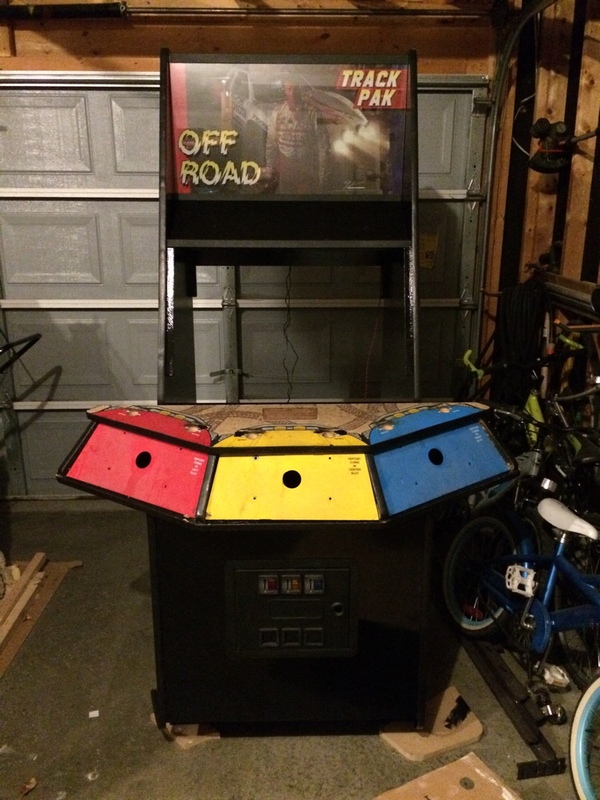 TheRealBobRoberts carries them (Atari TB optic board A052-1010/1), as do Arcadeshop (Atari/Happ Trackball Optic Board), and Twisted Quarter. Wow, thanks for that link BadMouth. You mean I could ditch the little spinning wheel altogether? Yup. And the boards that go with them. I guess all I would have to do is count the number of little openings on the original encoder wheel to see what the original count was right? As long as I aim for that and don't change the gear ratio between the wheel and the encoder things should "feel" relatively the way they are supposed to??? I wouldn't bother going to all that work. I'd ditch the gears altogether and just couple a higher count encoder directly to the steering shaft. I'd just buy whatever encoders I can get the cheapest then use the sensitivity settings in MAME to adjust them until they feel right. If you want to work out the math, there were apparently two different gearing setups used. a) 60 teeth on the steering wheel shaft, meshes with a 14 tooth gear on the encoder shaft, which has 36 teeth (slots?) on its encoder wheel b) 96 teeth on steering wheel shaft, to 14 tooth gear on encoder shaft, which has 24 teeth on encoder wheel. I think that means 154 or 165 pulses per revolution, but it's been so long since I looked at it I'm not sure anymore. I'd still go for a higher count encoder and adjust it in MAME. 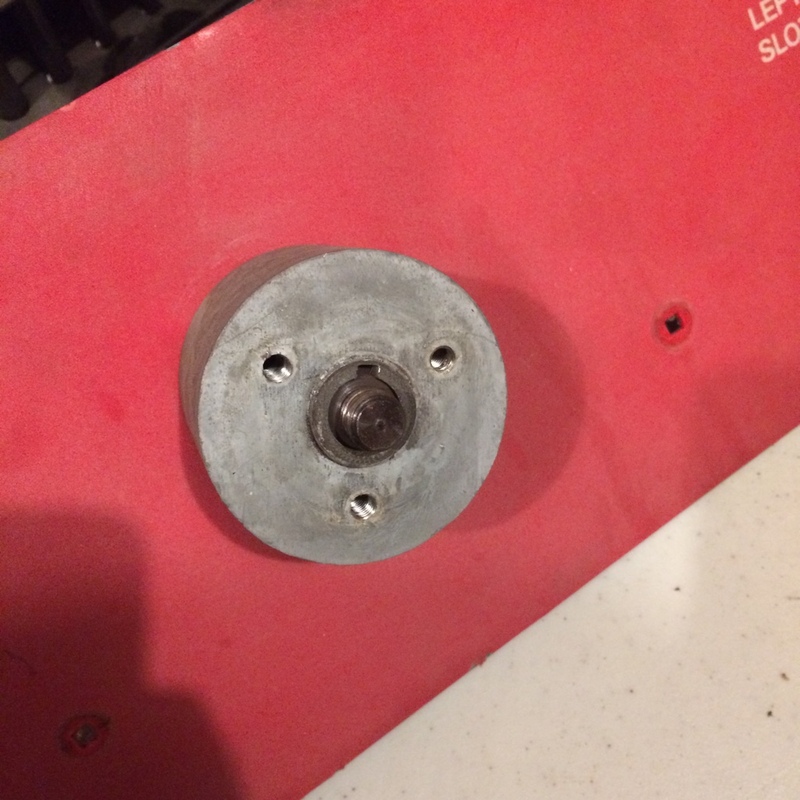 Just a fyi.... my home made 360 wheel is just two bearings and a shaft with the encoder board above and a regular trackball encoding wheel. I had to adjust the sensitivity, but after I did offroad (which I built it for) played exactly as I remembered. Most of the arcade wheel games don't have a lot of sensitivity to begin with. Thanks Howard. That is very helpful. 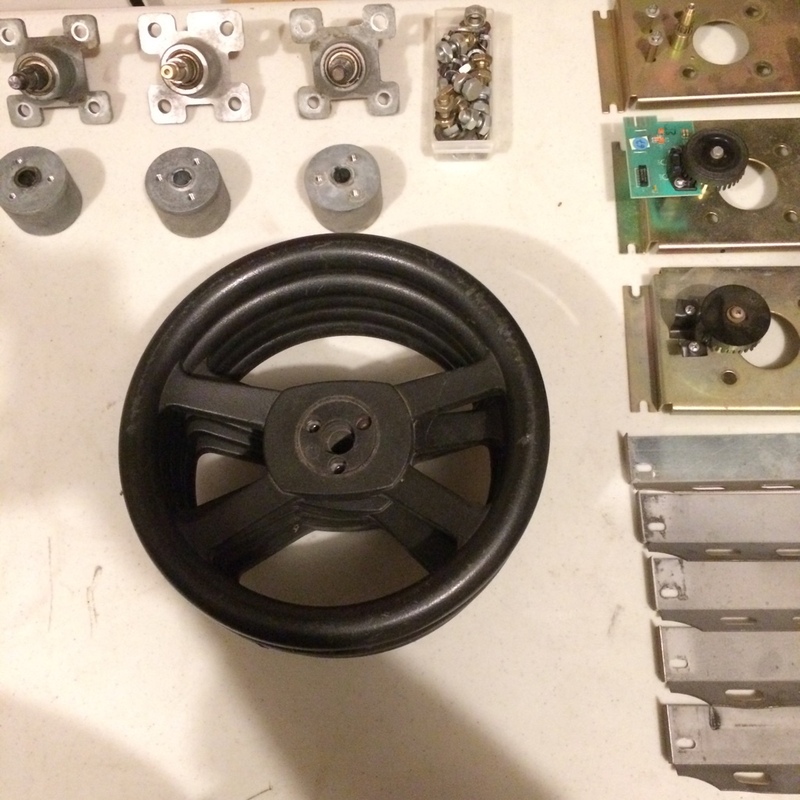 Okay, looking at grabbing these for the rotary encoders. They are cheap, they ship to Canada, and for this price I feel like I could get three and do all the wheels the same. I must admit I have no idea what single and double phase or a couple of the other lines of specs but 400 R/M is hopefully enough. I will likely get a single one to try it out and then order the other 2 once I have one working properly. Do you see any reason this wouldn't work? Do you see any reason this wouldn't work? Thanks Scott. I have one ordered. Lets see how long it takes to get from Hong Kong to Canada. Okay, now back to the controller board. 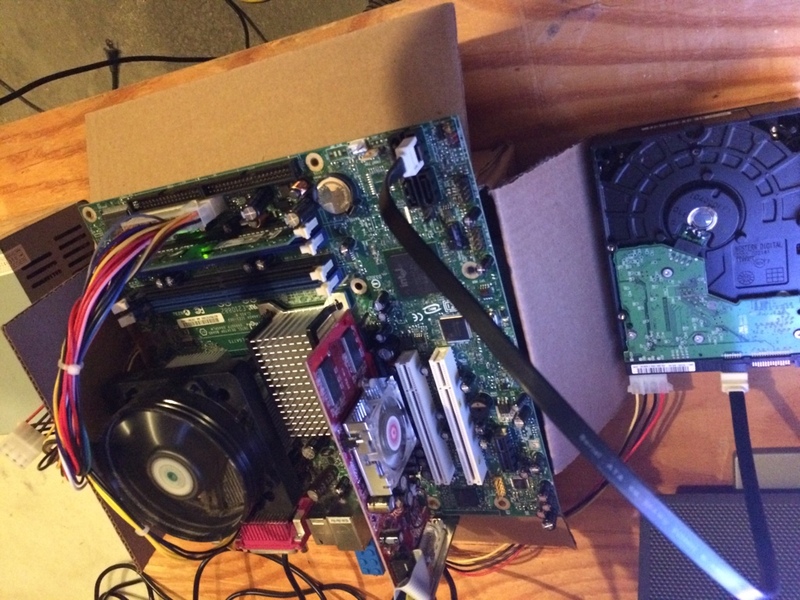 SailorSat said that the job can be done entirely by a single Arduino Mega. Does that mean that I need to buy an actual Arduino Mega or can I, for example, buy a SainSmart MEGA 2560 Board for Arduino from Amazon and use the same firmware? The reason I ask is that an actual Arduino Mega 2560 board is getting up into u-hid price territory while the SainSmart and other boards are much cheaper. If I have to use an actual Arduino Mega board I would probably go with the u-hid instead since it is going to be closer to a plug and play solution. Clone avrs with the same pinouts and chips are generally interchangeable. Check the I/O listing for the device. Thanks Howard. I will start comparing and get ready to pull the trigger. Just waiting on SailorSat for that github info. Thank you for the link and the info, SailorSat. I am going to order an Arduino (or clone) and try to get this working soon so that when the other parts show up I am ready for them. While I wait for some of the electronic pieces to arrive I decided to try and get the cab prepped and painted before the weather gets too cold to work outside/in the garage. I quickly found out that the bottom of the cab was completely hosed. I knew a couple corners needed work but I had no idea it was moldy. The bottom must have been soaked at one point. I cut out the bottom 5" of the cabinet sides and replaced them with 3/4" plywood. I removed the front kickplate and cut a new one and I replaced the bottom part of the back of the cabinet up to where the back door rests. It was definitely nerve wracking cutting off the bottom of the cab but I think it turned out pretty good. I still need to put the bottom back in. Is it just me or is the pedal unit missing? for offroad it's a detachable plate that just sits on the ground.... no holes in the cab. That's pretty much what the US version looks like. 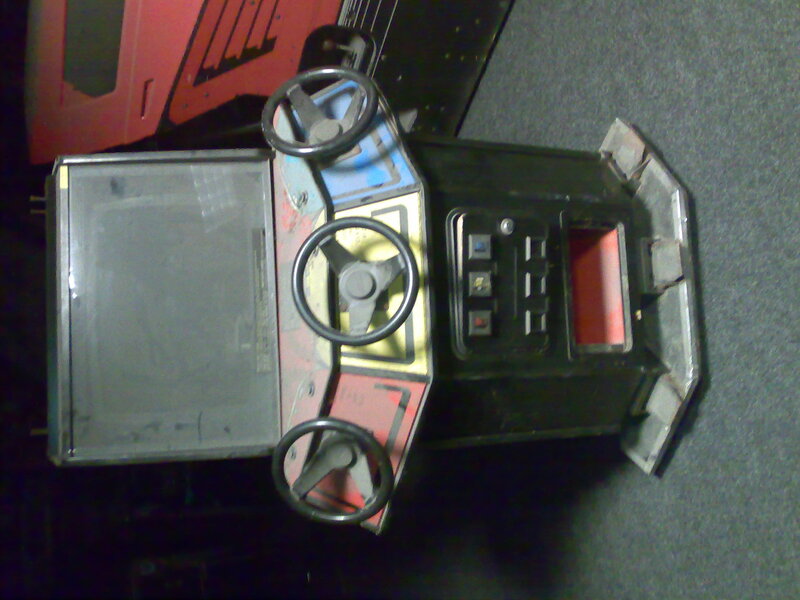 I didn't mean it didn't bolt to the cab, I just meant there isn't a cut-out on the front like some upright games. Yeah, it's not in the pic but it isn't sits in front and bolts onto the front plate. Yeah the coin door layout is totally different from what I'm used to seeing as well. The differences are interesting in that the changes don't seem necessary. I guess it's just manufacturing plant differences. Thanks for the pics SailorSat! The machine turned out really great! I liked how you were able to maintain all the original wiring. I'm not sure if I will be able to do that or not but we will see. I sanded and primed and primed and sanded over the weekend. I gave it a once over with Killz primer to lock-in the stench of the 25+ years of cigarette smoke the cabinet has absorbed. It seems to have worked. We go back to black by the weekend. My mega is on order and I should be able to start playing with it next week. Nice. I don't know what it is about off-road but I loved that game growing up. They had it at the Hills dept. store and I pumped a buttload of quarters into that thing. I member Hills. The Hills I went to had Final Fight and a Neo Geo. Ooh, and Ames. I still have a small dining table set that came from Ames. ....and Montgomery Ward. They didn't have any arcade games, but member Montgomery Ward? I hear ya. We had a decent arcade in the nearest mall and I always ended up at the off-road machine. The majority of my quarters went into a Neo Geo that was tucked into a local tavern near my high school though. So many quarters! So TIL don't buy your paint rollers at the dollar store. The fuzz coming off the low pile roller just cost me a nights work. Good thing I started with the back door. I can sand that down tonight and try again with better equipment. I am using gloss tremclad but think I may switch to semi-gloss. I like the little bit of texture and how this paint goes on but I'm on the fence about the shiny finish. Would semi-gloss be more of a traditional arcade cab finish?Thoughts? Okay, with the mega2560 on it's way I have questions about the best way to wire one of these for this application? Maybe I should just wait until it arrives but I am bit excited. I went for a clone (sainsmart) so I am hoping for good results. Yeah Ames took over most of the Hills. By the time they were around the store boasted TMNT and Operation Wolf. Whoever owned that route knew their stuff.... never a bad game. Later they got C.O.W. Boys of Moo-mesa and I thought "Wtf is that?" And strangely the show came later? I member Montgomery Ward. My mom works at Brickstreet so she's in the old MW section of the town center mall. Hi everyone. I have started working on cleaning, straightening and rebuilding the wheels but I am stuck at the disassembly part. Can anyone tell me where to go from here? Thanks. 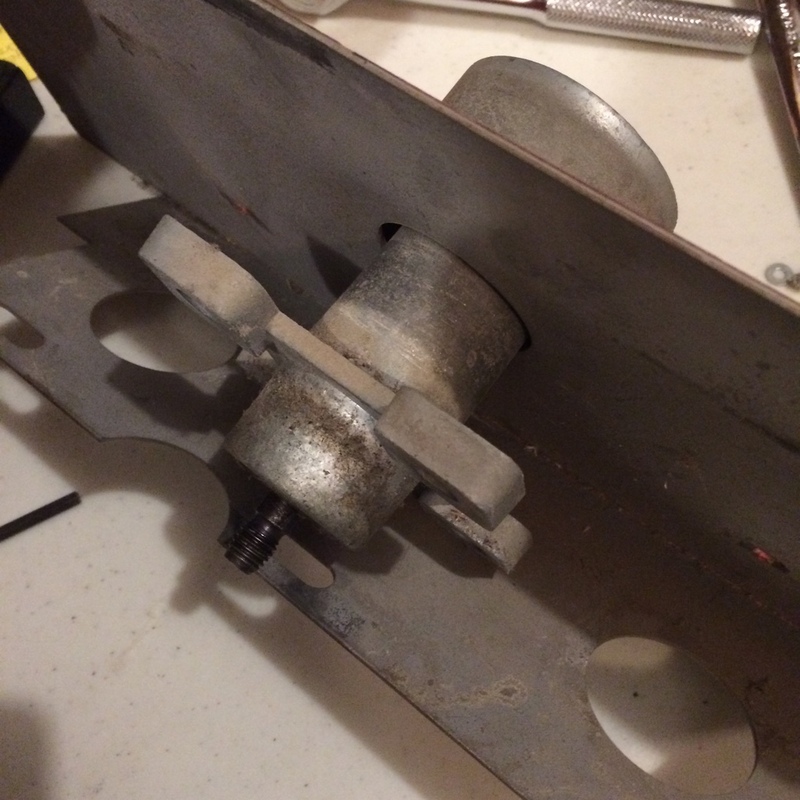 Based on the Happ ffb setups I've messed with, the hub that the steering wheel bolts to should slide off the shaft. You might need to use a pulley puller or persuasion hammer if it's stuck. There is a half moon woodruff key where that notch is. Don't lose it. After looking at the happ site, the key is rectangular, but same idea. That worked great. Thank you. Productive day - All 5 wheels pulled apart, parts cleaned, and ready to start reassembly. I hear the theme music in my head again. No music yet but it's time to play cram the beautiful 27" monitor in the tiny 25" space. It has S-video in and was free so the specs are right. This is about to get fun. So I definitely need to decase to fit things into the small opening. So far I have only taken the back off. Very intimidating. 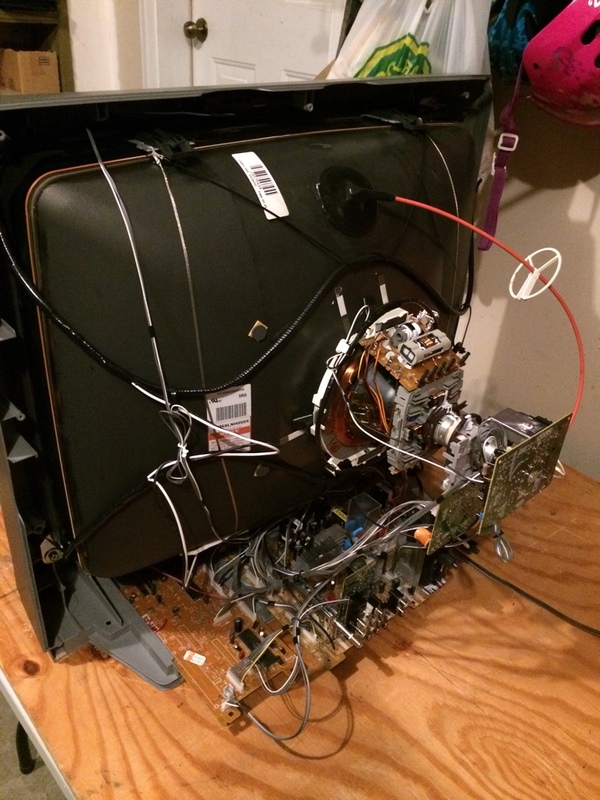 CRT=1, me=0. I imagine that this is a self discharging tube but but before I get into it I would still like to discharge it just in case. All the videos I have watched on discharge day to put the alligator clip on the frame. It I don't have a frame. Where should I connect to discharge? A little bit of progress. I threw together the computer I plan on using and collected the games I want to play on the cab. Hooked up the S-video cable and gave it a test run. I wanted to do this before digging into the decasing of the television. I think everything looked really good. Except windows. Does it always look really crappy on a TV? The fonts are almost unreadable. Yup. Very few of us use a tv at this point mainly for that reason. 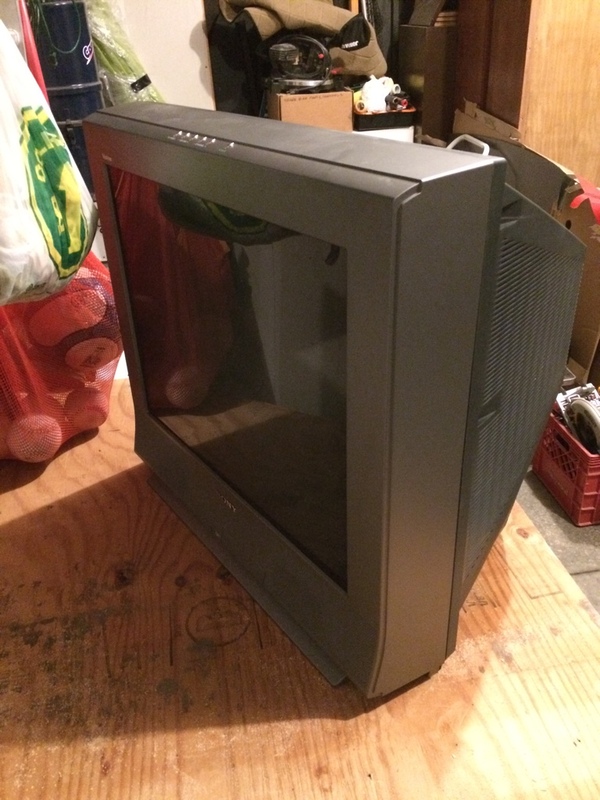 It's arcade monitor, computer monitor or hdtv. A TV is in most part like an arcade monitor. The problem here lies in the SVideo connection. In europe we use to connect the PC from VGA to scart, but there are differences between USA and european standards I am not 100% aware of. Yeah it's fuzzy, but not nearly as bad a the single rca component connection. 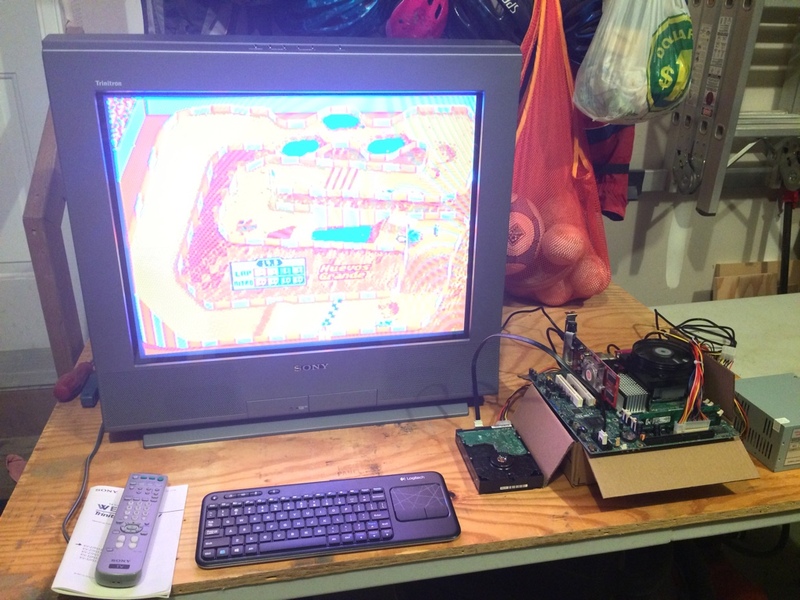 On my setups, I was able to use 1024x768 over s-video which looked a bit better than 640x480 for the games. When working in windows, I would reduce the resolution to make the words bigger. I was happy with it, but had to design the front end layout accordingly (keep the font big or use marquee images). Thanks everyone! 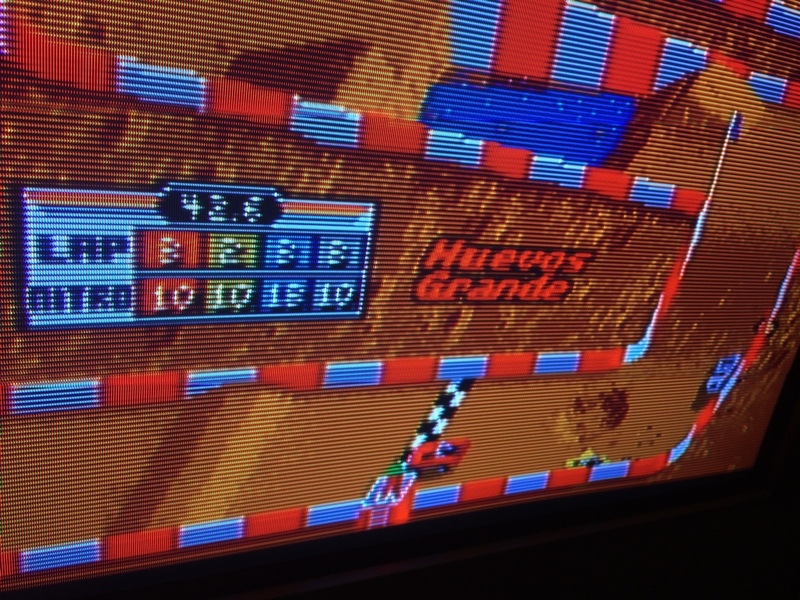 I don't really have a problem with the TV while in the games - I am actually pretty happy to be seeing the game on a low resolution CRT the way it used to be displayed. I am assuming that since the games were made to be played on screens of this resolution everything was kept to a respectful size during the design process - but I will try using 1024x768 to see if it makes any difference. I may have to hook up a 2nd monitor for setup that needs done in windows. SailorSat, you mentioned that you have some more pics of that build you did. Did you ever put those up anywhere? I am curious how the Arduino looked after being completely wired. I am excited to try and use all the stock wiring. Can I clean the old wires up with simple green? Will it eat the rubber insulation or dry it out? I used component instead of s-video. If I had to do anything in windows i just remote in with another computer. Great idea. I don't know if this one will be hitting the network but I will keep that in mind. I just checked and my TV has component inputs. How did you convert over to component from the computer?